Most My Little Pony dolls — save the limited edition commemorative Alien 3 models — boast lustrous, improbably long manes. 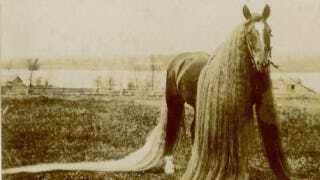 And back in the late 1800s, Linus the Wonder Horse and his hirsute progeny wowed carnival-goers across America. But who was this "Samson among equines?" [Professor C. B. Davenport and Professor C. E. Castle] have both called attention to cases of so-called wonder-horses, i.e. horses with remarkably long mane and tail. In the case of ''Linus I" the mane was 18 feet long and the tail 21 feet. The parents and grandparents of these horses also had unusually long hair, which increased in successive generations. The data are insufficient to show the relation of dominance and recessiveness in this case, but the persistence of the long hair seems to indicate its dominance. For years this "Wild King of Oregon Wonder Horses" roamed over the country, ever alert to stampede his followers and flee with almost the rapidity of the wind at the approach of a human being. So subtile was this wild leader of his race that it was only at rare intervals that the best hunters were able to even secure at a distance a glimpse of these marvelous equines. He is 16 hands in height, weighs 1,435 pounds and is of chestnut color. The mane is fourteen feet, the foretop nine feet, and tail twelve feet long. When spread and drawn out to their full extent, the display of the beautiful locks of bright hair is quite impressive. The greatest care is taken of the hair. It is washed out with cold water, no tonics being applied to it [...] During the last two years his mane and tail have grown about two feet. And if you wish to see one of these equine wonders today, Prince Imperial is still around. He was a long-haired horse who once belonged to Napoleon's nephew, died in 1888, and currently sits taxidermied and dreadlocked in Marion, Ohio. A true performer, even beyond the pall.